2. The word "Watching" looks disproportionately stretched. Ain't that a type no-no? 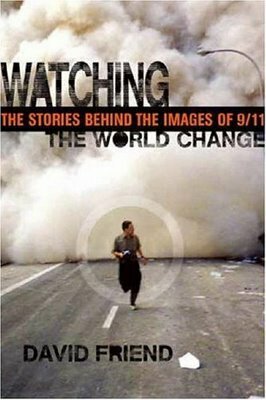 I think the word watching is oversized to emphasis the fact that the whole world was watching when the World Trade Centre was attacked. As for a circle around the man running, I can sense a purpose as to why that has been done, just nothing I can put in words. I think the circle might be an allusion to the hilights on the endless coverage of the events. . . in the way newscasters would hilight a body falling from one of the bldgs, etc. Vague, I know, but it's the best I can come up with. Otherwise, it makes no sense. As for the type, well, the size difference between 'Watching' and the rest of the title, beneath the black bar, makes it difficult to read as a whole title. I can understand wanting to emphasize the word 'watching', as per Orhan's comment, but I think they pushed too far, at the expense of coherence. The circle transforms the scene into one viewed through a camera lens--a circle like this is often used as a focal device. Very appropriate for this cover. And that's a camera the man's holding, right? Good call, springer. That makes sense. That does indeed make alot of sense. Well put. The circle is ok as a graphic device. It did make me think of a camera, because the first one I owned (manual) had one of these for focusing. However, as most photography is digital these days I can't help but think that the circle is gradually becoming less suggestive as a symbol for modern day photography. That said, I give points here for not using contact sheet imagery (...also becoming obsolete). it's that it's vertically-scaled and wrong-looking, and not in a good way. The graphic here is strong enough that a design with a much subtler, less stylized type treatment would have had more impact. From someone who designs book covers for a living, I appreciate this line of discussion. But I think there are way to many "rules" in designing covers and in layout out type. And I like type that runs close to the edge. See? It's all so subjective. my first thought in regards to the running man in the circle had to do with the circle representing a target, like from the view finder of a riffle or weapon. i say this as i remember the horribly vulnerable feeling that came over the many americans that day and for several days after. the man represents the universal fear felt in the us in those horrible days and weeks following 9/11. Okay, I think the circle is highlighting the man because the book is about the stories behind the images of 9/11. 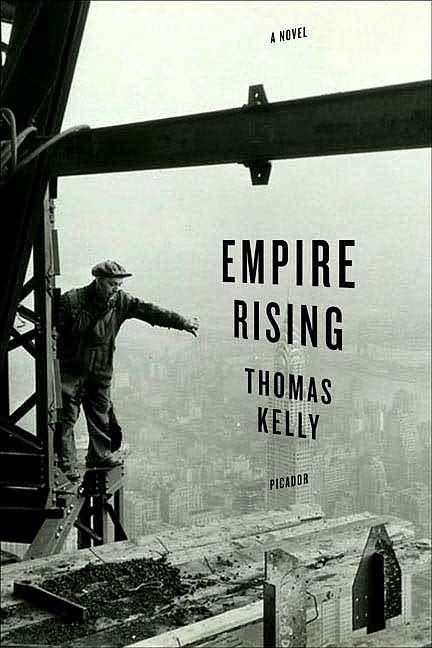 The thing that would really catch your eye when just looking at this photograph (not as a book cover) would be the giant cloud behind the man. The book, however, is about the people, not the events, so it's a visual cue to draw your eye away from what you normally notice first, and to the subject the book discusses instead.